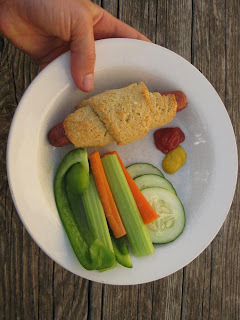 A twist on traditional pigs-in-a-blanket, these cornbread-wrapped hot dogs make an easy and kid-friendly dinner. I use all-beef hot dogs and whole grains for a delicious, wholesome taste. Makes 8. 1. Preheat oven to 450 degrees F. Whisk flours, cornmeal, baking powder, salt, and baking soda together in a large bowl. Add the oil and buttermilk together and stir with a large fork just until combined. 3. 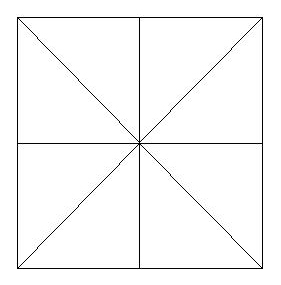 Wrap each hot dog in one triangle by placing the hot dog at the wide base of the triangle and rolling it up like a crescent roll. 4. Place the hot dogs on a rimmed baking sheet and bake for 15 minutes, or until hot dogs are browned and cornbread is golden brown. Serve hot with ketchup and mustard.